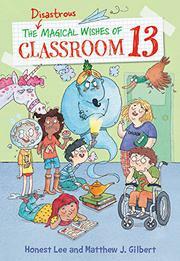 The diverse cast of Classroom 13 returns for another humorously exaggerated lesson on the flipside of good fortune. In the first book of this series, the students of Classroom 13 won the lottery—which didn’t quite work out as they had planned. Now, a magical lamp has fallen into the hands of their unlucky, white teacher, Ms. Linda LaCrosse. With a bolt of lightning and a cloud of smoke, a blue djinn appears, granting each child a wish. What a lucky classroom! When brown-skinned Isabella wishes for a unicorn, it destroys her house and leaves rainbow poop everywhere before growing a pair of wings and flying away. Each subsequent chapter catalogs a student’s wish and its catastrophic consequences. Even Earl the Hamster is given a wish, though his (sunflower seeds) goes quite well. In series opener The Unlucky Lottery Winners of Classroom 13 (2017), the lesson learned was “money does not buy happiness.” The djinn’s advice to the students? “Be careful what you wish for.” In the chapters from the students’ perspectives, the word “genie” is crossed out and replaced with the word “djinn,” both a running joke and an emphasis on cultural respect. An interesting new “character” awakens this time around—the actual classroom. The third book in the series will address the hilarious and unfortunate side of fame.